Ever wish your BitTorrent client could automatically download new episodes of your favorite TV shows? That's the idea behind ShowRSS, a site that turns TV shows into RSS feeds. Okay, let's back up a few steps. BitTorrent is a file-sharing tool. BitTorrent clients are programs that leverage the technology. Many of these clients support RSS feeds, meaning that when new downloads appear from a particular source, they can automatically download them. ShowRSS makes it simple to find the feeds for hundreds of shows, and it weeds out duplicates so you don't wind up with half a dozen downloads of the same episode. Depending on how you've set up your client, the feeds should automatically download new episodes as soon as they're available. 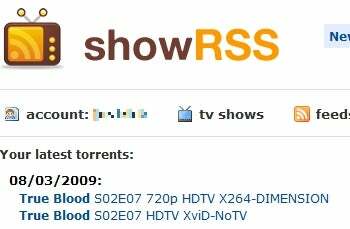 ShowRSS lets you choose between standard-def and 720p (HD) downloads where possible. Disclaimer: It's not illegal to use BitTorrent or ShowRSS. It is, however, illegal to distribute copyrighted material without the owner's permission. I strongly believe artists deserve to be paid for their work.